A comprehensive approach to selecting a college that is in tune with a student’s learning style, this guide offers a personalized, psychology-based approach to selecting the perfect university. Taking into account personal interests and personality types, this reference will help students and parents choose the most appropriate school from the listings of nurturing liberal arts schools, research-oriented universities, creative or spiritual campuses, and more. With accessible tables and simple descriptions of campuses and majors, college bound students and their parents will find self-assessments and suggestions for 82 well-known colleges. This book is long overdue! At last two professionals have combined qualitative research, experience, interviews, and site visits to produce a practical guide for college bound students and their families. It is an easy read filled with commonsense strategies every decision maker in today’s economy needs to reach the appropriate site ‘match.’ Hats off to these two—they hit the bull’s-eye! 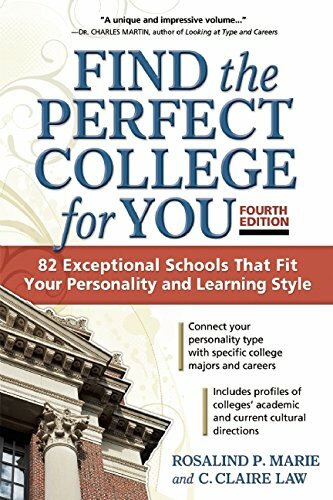 A unique and impressive volume that can serve readers who want to use personality type as one of the tools for understanding and choosing a college.